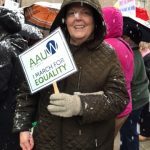 AAUW is now contributing to the BSU Campus Food Pantry. The pantry offers nourishing and cost-effective meals and provides nutritional education to students facing food insecurity. 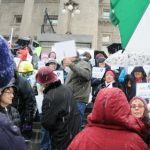 Donations will be collected at branch meetings. Check your newsletter for current list of needs. Donations are greatly appreciated. Contact Chair Christine Santos for more information. 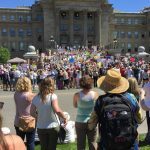 Many local junior high and high schools are in dire straights when it comes to having feminine products available for female students who cannot afford supplies and actually stay home from school as a result. 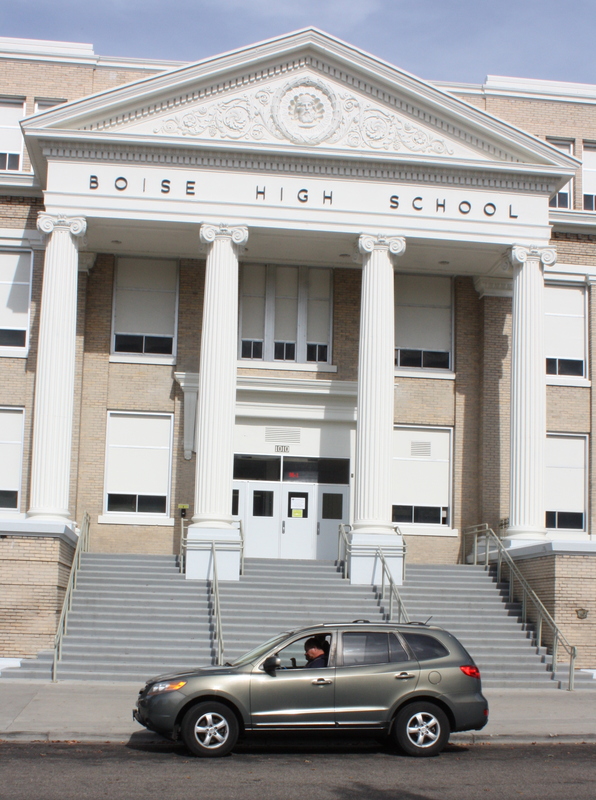 This year, 2018-19, is a trial project, with Donna Looze leading the charge. 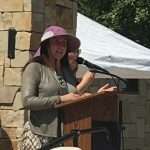 Please contact her to get involved in this worthwhile project. 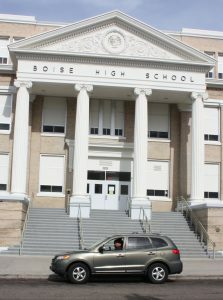 In addition to our more traditional college scholarship, the Boise Area Branch developed Project Recognition to bring attention to Treasure Valley high school students who have gone above and beyond by serving their communities through extra curricular achievements. Students chosen are honored at a ceremony and receive a monetary award. Each year three local high schools are asked to submit nominees. 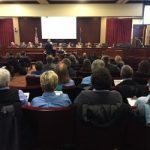 The recommendations are reviewed by the branch’s Project Recognition team. 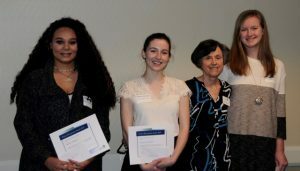 Awards are presented at the April branch meeting. Contact Chair Paulette Penney for more information. 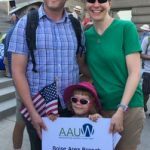 Tax-deductible contributions to Project Recognition may be sent to the branch finance officer. 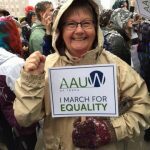 Please send your check, payable to AAUW Boise Area Branch, Inc., to AAUW Boise Finance Officer, PO Box 16548, Boise 83705-5353. Please specify “Project Recognition donation” in the memo line of your check. Thank you. 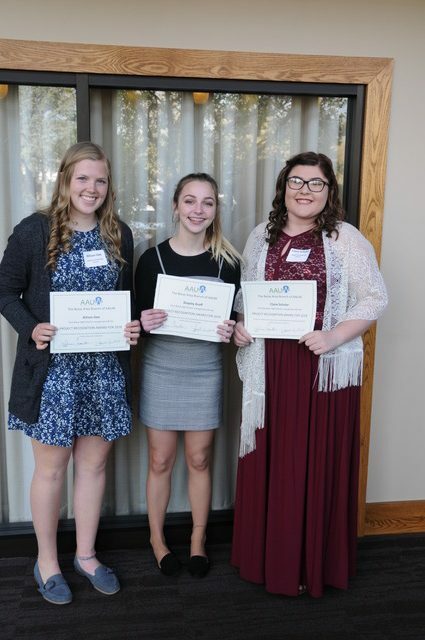 Chair Lee Hipsher with 2017 recipients: Skylar Haynes, Ridgeview HS; Grace Gonzales, Bishop Kelly HS; and Danika Van Den Akker, Mountain View HS. Congratulations! 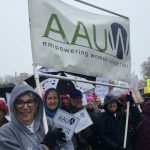 AAUW supports promoting and strengthening science, technology, engineering, and math (STEM) education, especially for girls and other underrepresented populations. 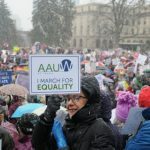 These efforts will increase America’s competitiveness by reducing barriers that deter women from pursuing academic and career goals in these fields. 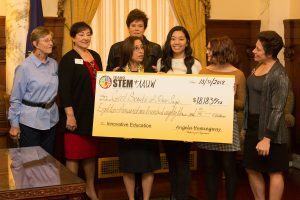 In 2018 we began the branch’s second year as partners with the Stem Action Center (SAC). Check their website or our own Calendar page for upcoming events. 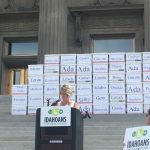 supporting the recently established Idaho STEM Action Center in reaching its goals. 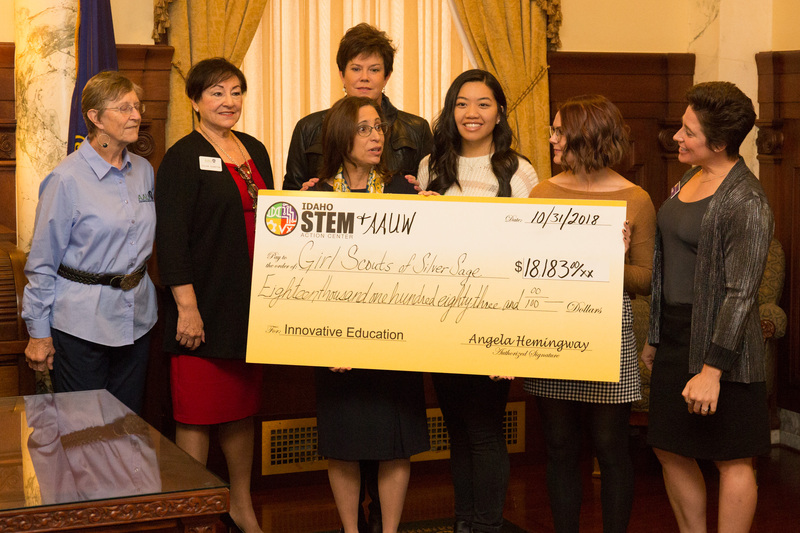 Through these efforts we hope to encourage students to experience the thrill of discovery in STEM fields and encourage them to pursue the challenges of those fields! Contact our STEM Chair Donna Looze for more information and to get involved. 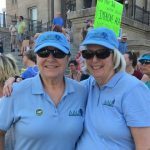 Please help fund the advancement of our STEM Project. 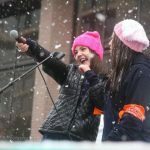 Donations will support STEM activities for local girls! GIRL POWER — (November 2, 2018) Idaho First Lady Lori Otter and STEM Action Center Executive Director Angela Hemingway joined the Boise Area Branch of the American Association of University Women and the Idaho STEM Action Center in presenting an $18,183.16 check to Girl Scouts of Silver Sage. 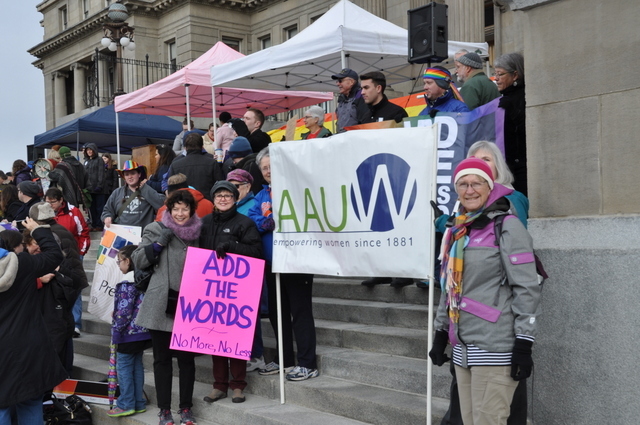 Due to the incredible generosity of AAUW Boise Area Branch members, our branch donated $8,783.16 to the Girl Scouts of Silver Sage to provide scholarships for Girl Scouts to attend STEM camps. 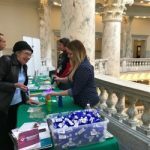 The branch was honored to partner with the Idaho STEM Action Center on this worthwhile effort. 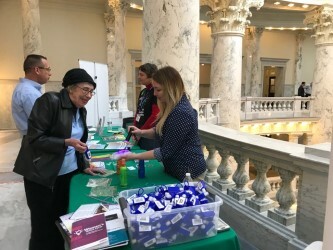 Donna Looza and Sylvia Chariton participated in the check presenting ceremony, along with Idaho First Lady Lori Otter and STEM Action Center Executive Director Angela Hemingway. 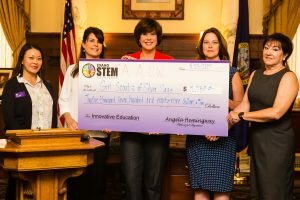 BOISE, Idaho (Aug. 23, 2017) — GIRL POWER — Idaho First Lady Lori Otter (center) joined the Boise Area Branch of the American Association of University Women and the Idaho STEM Action Center in presenting a $12,789 check to Girl Scouts of Silver Sage at the Idaho State Capitol. In 2017, our branch donated $5,789 to the Girl Scouts of Silver Sage to provide scholarships for Girl Scouts to attend STEM camps. 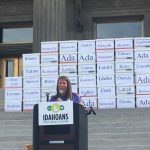 The branch was honored to partner with the Idaho STEM Action Center on this worthwhile effort. 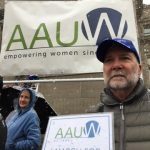 The branch’s latest incarnation of AAUW’s citizen lobby corps began in 2015. 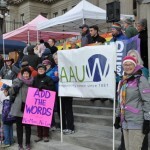 The team’s mission is to advance AAUW of Idaho priority issues during the Idaho legislative session. 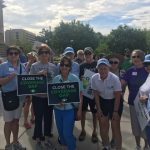 Key issues chosen for focus during the 2017 legislative session included the following: Add the Words, Early Learning, Education Funding, Human Trafficking/Sexual Assault, Close the Gap and STEM. 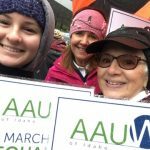 Visit the AAUW Idaho Advocacy page for more information. 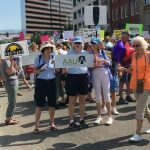 Join us and make your voice heard! Contact our branch public policy chair for more information. 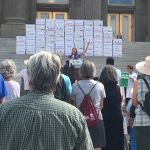 Members join Branch Co-President Kathy Scott and Public Policy Chair Julie Custer at the Idahoans for Healthcare Rally at the Statehouse on July 6, 2018. 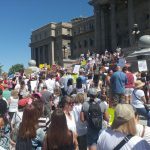 Members attended the Families Belong Together rally at the Statehouse on June 30, 2018. 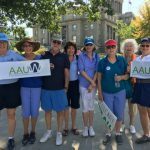 Members representing AAUW march from the Idaho State Capitol to the Idaho Anne Frank Memorial in Boise to support the March for Health Care, July 15, 2017. 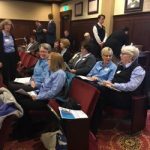 Last two photos show Statehouse Lobby Corps members attending Health Care policy listening session, January 24, 2018. 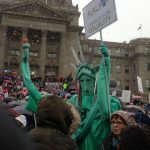 Read the Idaho Statesman Guest Opinion pieces written by Sylvia Chariton and Amy Bruggeman in 2016 here. 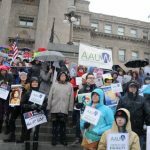 Chariton addresses Title IX; Bruggeman discusses the need to fill the current Supreme Court vacancy, following the death of Justice Scalia. 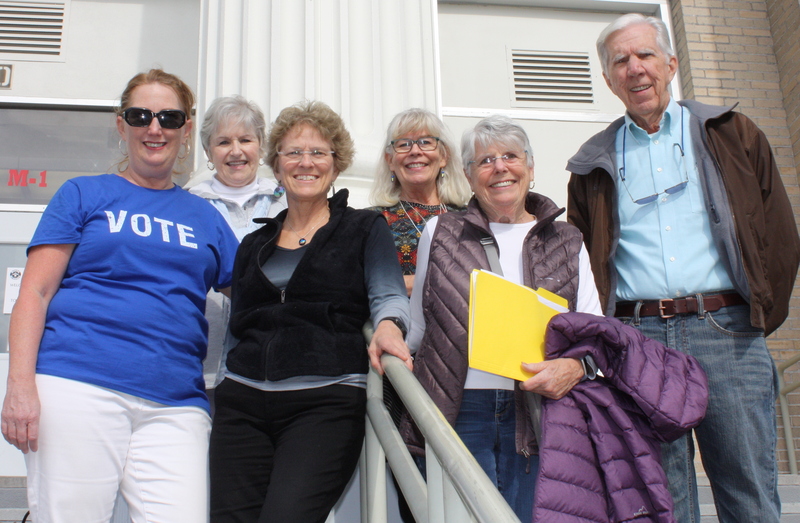 Equal Pay Day was Tuesday, April 14, 2015. 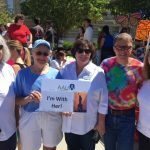 The branch met at the Riverside Hotel for ‘UnHappy Hour,’ to recognize the symbolic day and celebrate Lilly Ledbetter’s birthday. Download an event flyer and brochure. 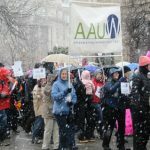 Visit FightForFairPay.org for more information about pay equity. 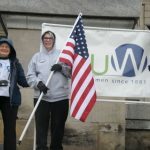 In 2016, 2017 and 2018, the branch held less formal “UnHappy Hours” for members to mark Equal Pay Day.